Here are a few "Jungle Book" pre production images I want to share with you. The first painting is a background study by Walt Peregoy. Walt had been in charge of color and some layouts for "101 Dalmatians" and "Sword in the Stone". He brought a great sense of experimentation to these projects with unusual colors and strong graphic design. 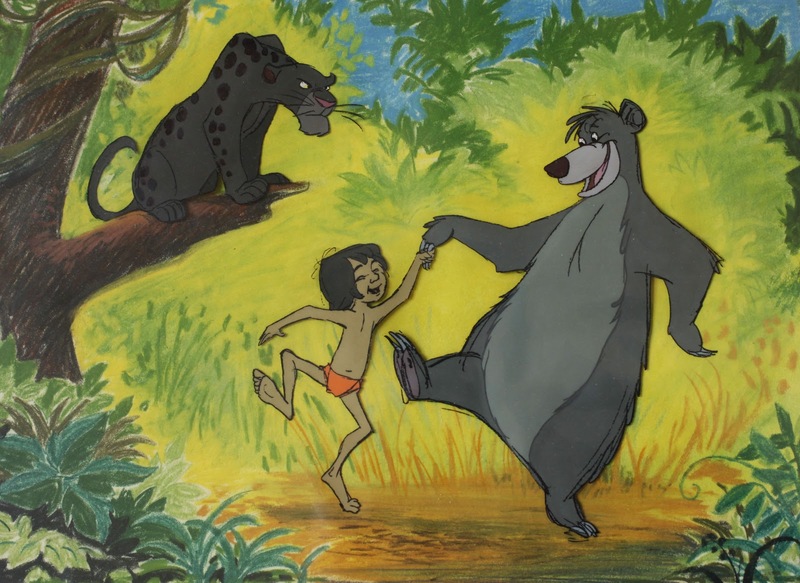 By the time the style of "Jungle Book" was being developed, Walt Disney opted for a softer, more painterly look for the backgrounds. Peregoy disagreed with that approach and left the studio. Personally I love the final art direction, but a jungle influenced by Peregoy's abstractions would have been stunning, too. This is a simple Peregoy jungle backdrop with a character cel overlay. The drawing is by Milt Kahl, and I love the rough quality in it. Here we have another early Milt Kahl drawing, made into a painted cel. 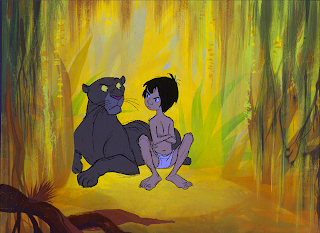 It's interesting to see that Milt drew black spots on Bagheera. I think it looks kind of cool as it reflects the appearance of a real black panther. But for economical and perhaps aesthetic reasons they were dropped in the final design. As far as the background sketch, I am 90% sure it is the work of Vance Gerry. In any case it's interesting to study these works in progress and to find out what kind of art was produced to get to the final result.